That silver or gold ring you are wearing didn’t always shine with such brilliance. When those elements were resting in the earth awaiting excavation, they had company – nasty impurities. These would have to be removed before that precious substance could be formed into something worthy enough to be displayed behind showroom glass. 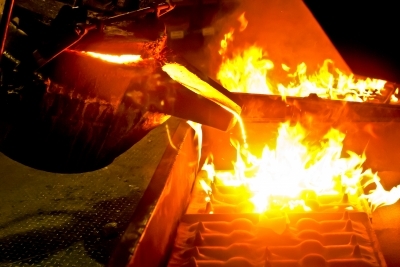 To purify metal we need heat – so much heat that the metal melts. In that state, the impurities loose themselves from the metal and float to the top. The refiner scoops off this dross, leaving only the precious metal. The more refining steps taken, the purer and more valuable the metal becomes. Insert “life” for “metal” here. My life is a picture of that nugget buried deep in the earth – precious but filled with imperfections. Sadly, in my nature, I tend to find myself OK with this. I mean, Jesus was the only perfect man who ever lived and I’ll never measure up to His standards. So why make a fuss about a few blemishes that are in my life? God loves me just the same regardless. However, He also wants more of me. Tests come in the form of hardships, trials, and challenges. These work in my life to melt away the crustiness in my being. Every methodical step in the process, works to remove the unwanted material present in my life and bring me closer to God’s intended design. Only then do I become more valuable, a person uniquely capable of fulfilling a purpose. But the transformation will not happen as described unless I’m willing to undergo the refining process. Sometimes I’m the stubborn metal that doesn’t want to be heated. In the difficulty of the moment, I rarely understand why challenges come my way. I would just assume life sail smoothly along with no bumps and bruises. That’s not the Refiner’s way. What are you currently learning through a hardship or challenge? Is there something holding you back that needs to be removed from your life? “ATTN Men: A Woman Values Security. Get It For Her!” in the Carnival of Financial Planning at Planting Our Pennies. “4 Ways to Punch Through the Scary Questions at the Start” in the Financial Carnival for Young Adults at Financial Nerd. Thank you to the carnival hosts for including my post. Reminds me of one of my favorite praise and worship songs, Refiner’s Fire. The struggles and obstacles may be painful, but they also bring us closer to Him. I love that one also Lisa. Some people fail to see it, but thru struggle, testing, and trials we learn and get better and become like Him. If the life was easy with no challenges we wouldn’t be here. And it wasn’t the Plan either. Agreed Martin…I may not like the struggle when I’m going through it but in the end, I know it’s valuable for me. God definitely likes to refine us day-after-day and year-after-year. It’s interesting to look back and see some of the challenging times I’ve gone through and thinking of how far I’ve come. Great post and great reminder that challenges and hardships are God’s way of refining us. I agree DC. I just have to remind myself that I’m being refined when I’m go through the challenges. Most times I forget that and become discouraged about the tough times. Instead I should look on them as a blessing that He is making me into something more. Seems counter-intuitive that trials work that way, but they do.